Once you've connected your sales channels to your SKULabs account, you can start building a catalog in SKULabs to link your sales channel listings to. Once this is done, you'll have a central database of items and inventory, and the ability to push out product pricing and inventory data out to your connected stores. Unlike other inventory management solutions available, SKULabs maintains its own item catalog, kept separate from your sales channel listings. Once an item is created, it can be linked to one or many sales channel listings. When those listings appear in an order, SKULabs will know which item should be picked from inventory, and which item to deduct inventory quantities from after the order has been shipped. There are a couple of reasons for this separation between listings and items. First, SKULabs can add information to an item that may not be available with a sales channel listing. For example, not every sales channel supports barcodes, which are required for a number of tools in SKULabs. This extra data can be managed in an internal item without affecting your online products. This separation is also advantageous for multi-channel sellers. If you sell the same product through multiple stores or marketplaces, you don't want them to have separate barcodes or inventory counts. To avoid that, you can create the item once in SKULabs and link all of those different listings to it. An item that is linked to multiple listings can pick and ship orders from any of the connected channels, keep a central inventory count, and push inventory changes back out to those channels. If you have sales channel listings that sell more than one physical product, such as a bundle or a multi-pack, then it may not be appropriate to track inventory for that listing separately. In this case, you wouldn't want to create a separate item for the listing. Instead, you should create a kit so that you can link the listing to multiple items. A kit does not have its own barcode or inventory count. Instead, it has set contents of items and quantities needed to fill it. Kits can be built with multiple items and/or multiple units of an item. A kit's inventory count is calculated based on the current inventory of its contents. When a kit listing appears in an order, you'll be prompted to pick and ship each of its contents, whose inventory will be deducted appropriately. 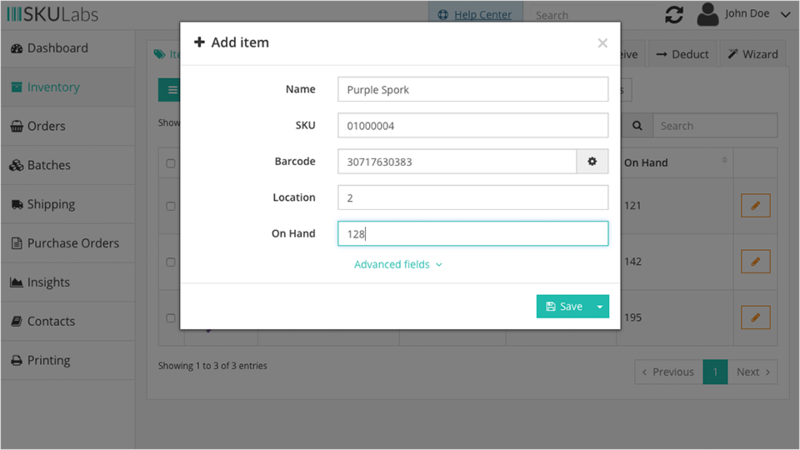 SKULabs features a number of ways that you can flesh out your catalog and initial inventory counts. There are pros and cons to each method, so it's important that you consider each option to determine which is right for your needs. Remember that items can be modified or deleted after they're made, so anything done in this process can be undone if needed. In the Items tab, by selecting Add item from the menu. On a listing details page, by selecting Create new item in the Items panel. In the catalog setup wizard. Through a bulk CSV spreadsheet, by selecting Bulk import from the Items tab menu. Through our API with a POST request to /item/create. When creating items, keep in mind that the name, SKU, and barcode are required and must be unique for each item. While the initial inventory and location are optional, they are recommended. Depending on the method of item creation you choose, you may have the opportunity to add more item information. Optional information includes shipping dimensions and weights, Amazon fulfillment SKUs, purchasing costs and retail prices, and more. Once you've created an item, you can link it to the appropriate sales channel listing(s). You can do this by opening the Item detail page and selecting Link listing from the Listings panel, or by opening the Listing detail page and selecting Link to existing item from the Items panel. If you sell from a single channel, or have a channel that you may consider your "primary", then you can save a lot of setup time by building your items automatically from that channel's listings. This tool will go through all of your store's un-configured listings, create new items for each of them, and link the new items to their respective listings. To build an item, SKULabs will take the listing's name, SKU, main image, barcode (if available), and inventory (if available) and populate the item with that information. If the barcode is not available, whether it isn't required or isn't supported by the channel, SKULabs can either use the SKU as the barcode or generate a new barcode on the spot. You can find the Build items tool in the Items tab menu. You can also set item building as the default action for a channel by editing that store's Import setting. When listings are synced, SKULabs will apply that import action to any new listings it finds. While the item building tool can save a ton of time, there are some potential drawbacks to consider. First, if a listing is better off linked to a kit instead of an item, you would need to go back and delete the item that was automatically built and then manually link the listing to the appropriate kit. Also, if you sell the same items on multiple channels, you run the risk of auto-building duplicate items if you aren't careful. Finally, you won't have the opportunity to add optional data such as the fulfillment weight and dimensions with the auto-build tool, though that information can be added later through a CSV import. If you have already added items to your catalog, either through a manual method or through the auto-build tool described previously, you can link un-configured sales channels to their appropriate items automatically in many cases. This is especially handy in multi-channel scenarios, such as when you need to link many listings from a "secondary" channel to the items made for your "primary" channel. The Link listings tool, available in the Items tab menu, can search your channel listings for any un-configured listings with SKUs matching the SKU of any items in your catalog. If a match is found, the listing can be quickly paired to the item. New listings can be checked automatically for SKU matches by editing a store's Import setting. When listings are synced, SKULabs will apply that import action to any new listings it finds.